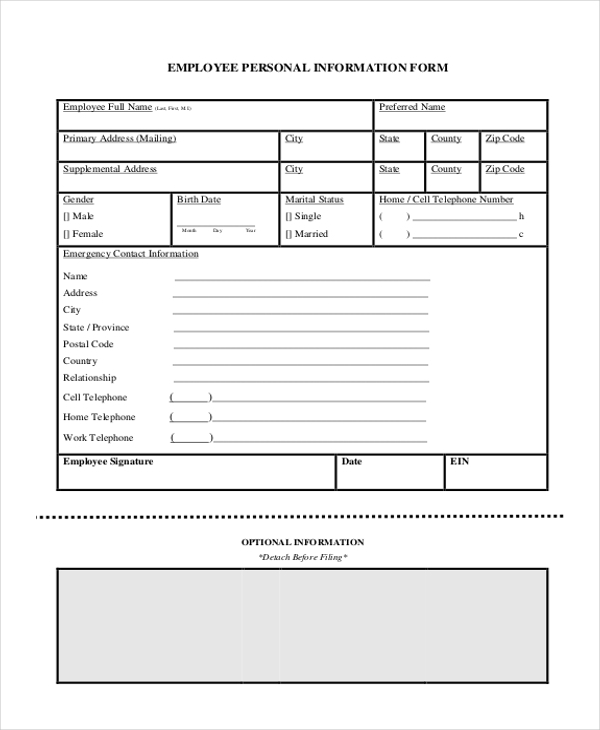 Employee information form enables the human resource department to record employee information. They help to obtain a variety of information from the employee like emergency contact information, ethnic group details, and military information. They also enable to update the employee information and record employee’s bank account details. They help to record updated employee information like a change of address as well. To get more information about these Employment Forms one can search Google using Employee Declaration Forms or Employee Status Change Forms. 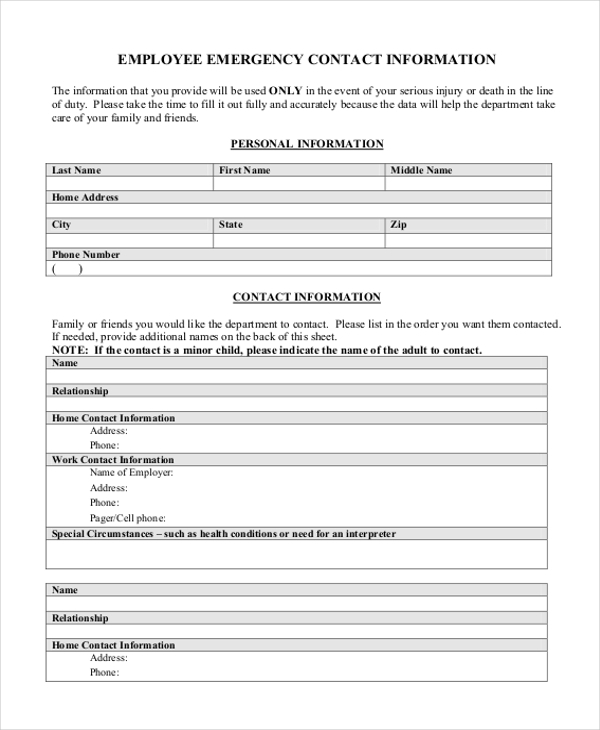 This employee personal information form presents the employee full name, preferred name, primary address, supplemental address, gender, date of birth, marital status, phone number and emergency contact information. It also obtains the signature of the employee. 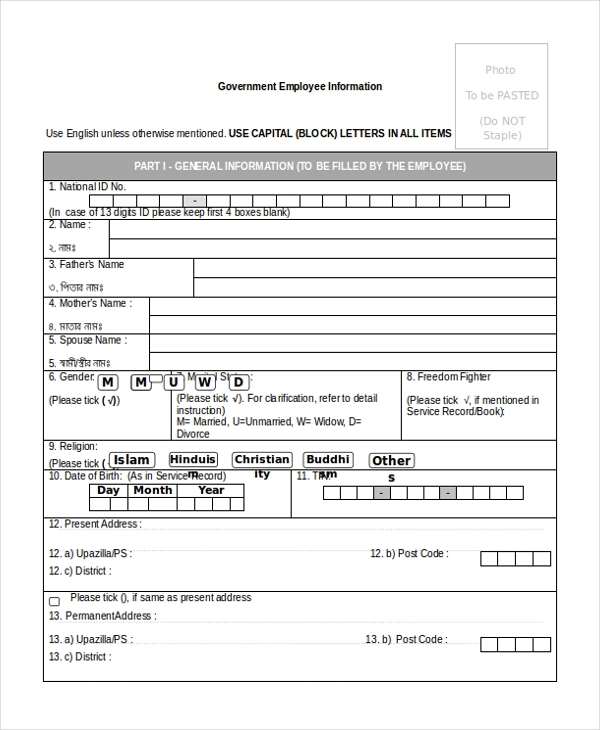 This new employee information form presents the employee id or SSN, phone number, name, date of birth, address, gender, marital status, race or ethnic group details and military information. It obtains the signature of the employee as well. You may also see Self-Employment Forms. This employee emergency contact information form presents the employee name, address, contact number, and the name of the person to contact in case of emergency. It also mentions the relationship and address of the contact person. 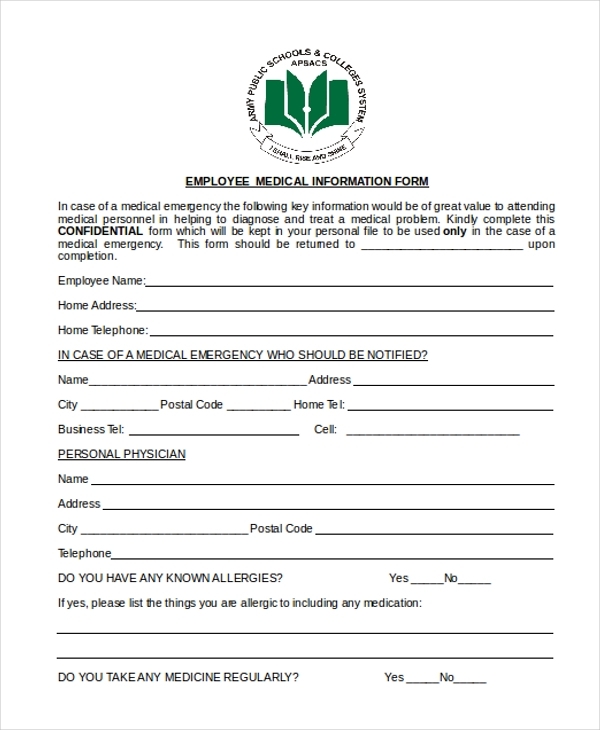 This employee medical information form presents the employee name, home address and contact number, the name of the person, his address, phone number to contact in case of medical emergency. It also mentions physician name, address, and telephone number. It obtains the details of the medical history of the employee. 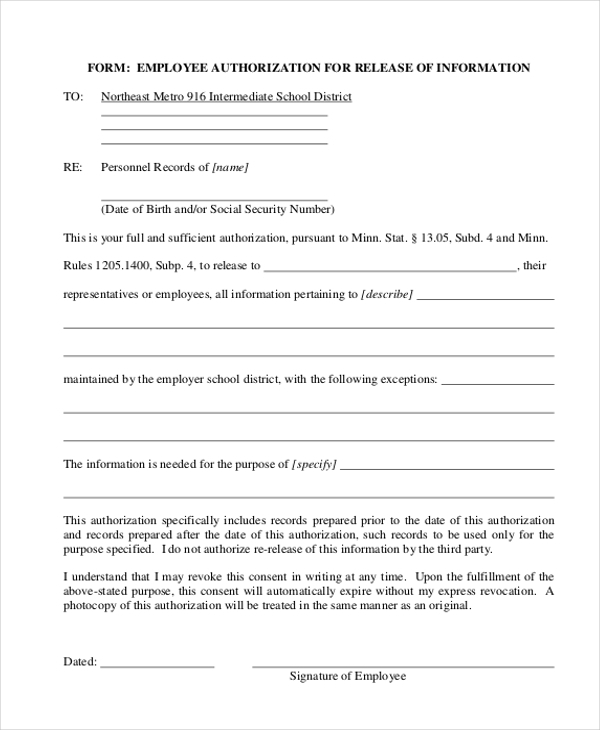 This employee authorization for release of information form presents the employee name, date of birth and social security number, the name of the representative or employee and information details. It also mentions any exception and the purpose of the information. You can also see Employment Authorization Forms. 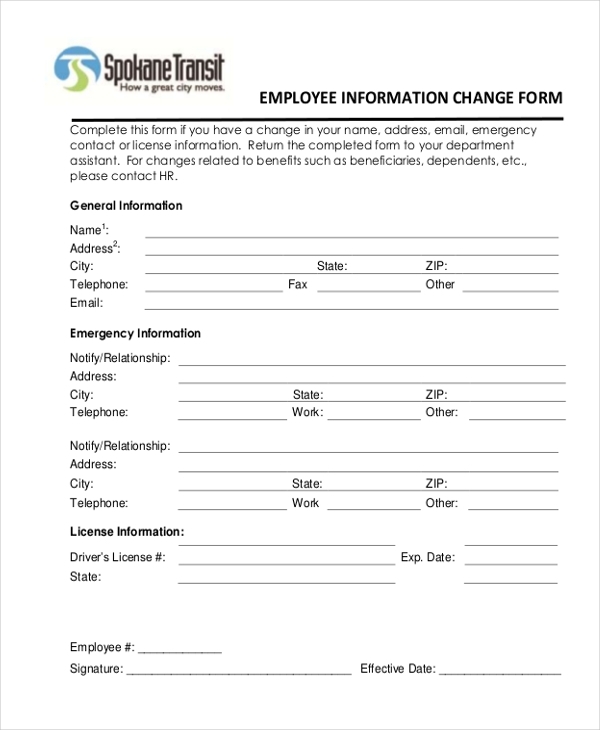 This employee information change form presents the home address, mailing address, phone number, emergency contact information, new name, email id and marital status. It also presents the personal information like gender, date of birth and smoker status. The details of education and military status are obtained. This government employee information presents the national id number, name, father’s name, mother’s name, spouse name, gender, marital status, religion, freedom fighter information, date of birth, TIN, address, contact number and email address. This temporary employee information form presents the name, address, date of birth, contact numbers and tax file number. It also presents the bank deposit information like bank name, branch, account number, bank address and type of account. 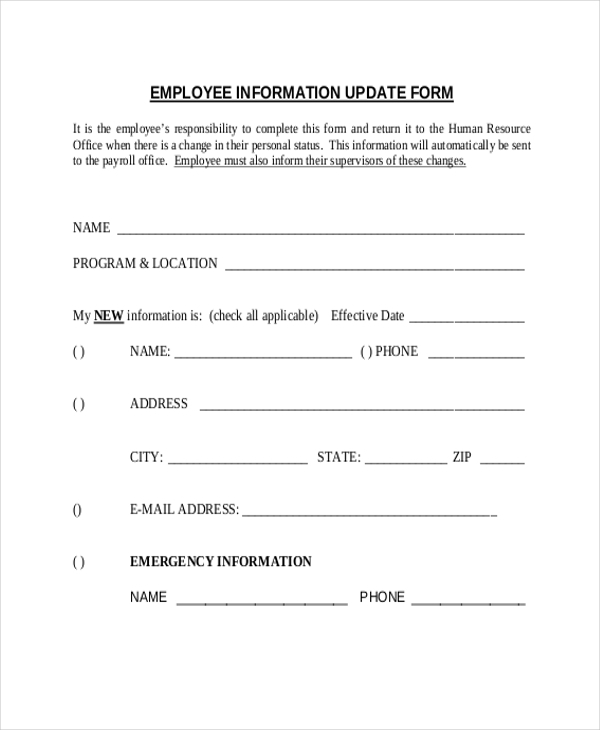 This employee information update form presents the name, program, and location, updated information like name, phone number, address, email address, emergency contact information such as contact name and phone number as well as the new information effective date. 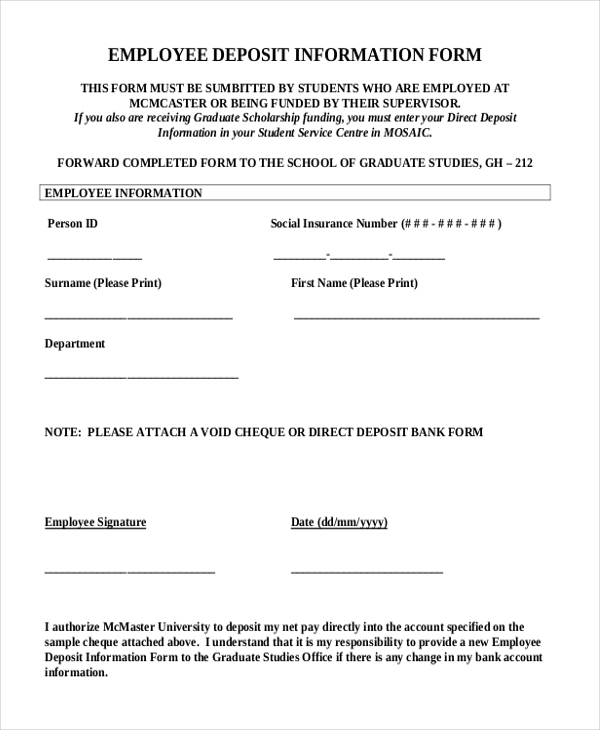 This employee deposit information form presents the person id, social insurance number, surname, first name and department. It also obtains the signature of the employee and date of signature. It requests the employee to enclose a void check. 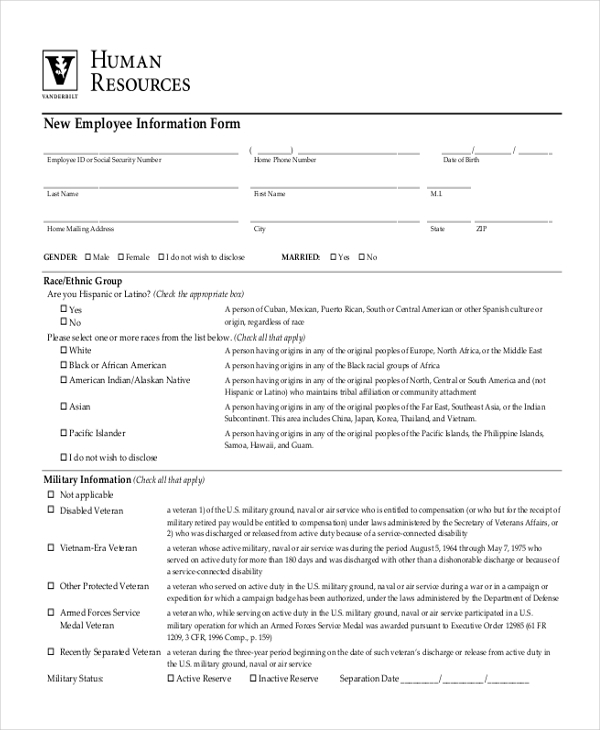 What are The Details Should Employee Information Form Contain? 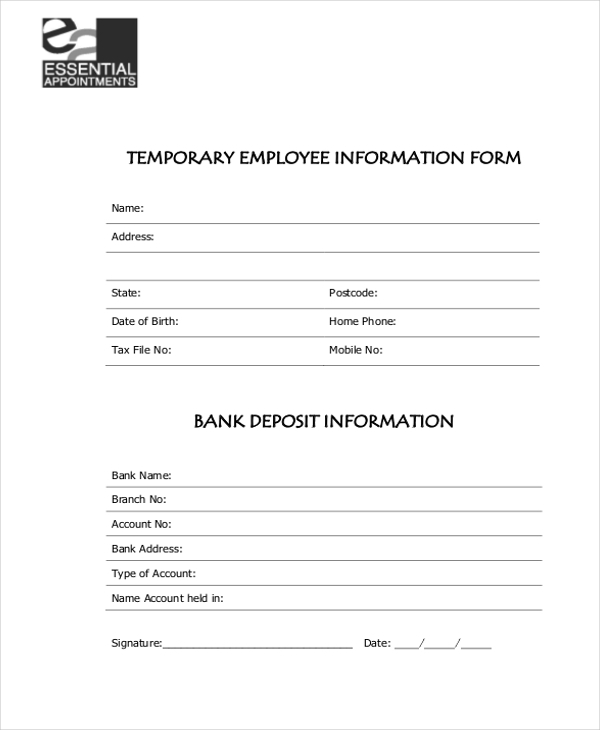 Employee information form should contain personal, official and bank account related information in detail. They should also contain emergency contact information like relative or friend’s name and contact number which helps the organization to contact them in any emergency. They should also record the employee’s physician details like his name and phone number to seek assistance in the case of any medical crisis arises. They should also obtain latest or updated employee information like change in address, emergency contact information, etc. and the effective date of the change in information as well. You can also see Employment Application Forms. What are The Benefits of Employee Information Form? There are plenty of samples and templates of Employee Information Forms are available on the internet and one can download them easily. They come in printer friendly format and are simple to customize as well. They are widely used by the HR department to file updated employee information that is essential for the organization.